Schildkraut, Jaclyn and Muschert, Glenn. Columbine, 20 Years Later and Beyond: Lessons from Tragedy. Praeger, 2019. ABC-CLIO, publisher.abc-clio.com/9781440862533. 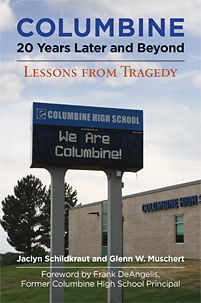 This powerful retrospective analysis of the aftermath of the 1999 Columbine High School shooting considers society's response to the attack, the long-term implications of the shooting, and the ways in which research and related policy must continue to move forward.